Safe to say, 2014 has been pretty good to the Sleigh Bells so far. They’ve played numerous festivals where they thrilled audiences, and the duo seem to be building up steam as they go, with no signs of stopping. And now, they’ve released the dates for the upcoming summer tour. If you’re wondering just how well the duo has been doing lately, check out Raymond Flotat’s recent review of their live set at SXSW. Indeed, playing live shows seems to be becoming something of a strong suite for Sleigh Bells. Their January appearance on the David Letterman show was also featured on MXDWN, and you can view the video here. They also have a made a string of festival appearances, including this year’s Coachella, as well the upcoming Firefly, Governor’s Ball, Counterpoint, and Roskilde festivals. 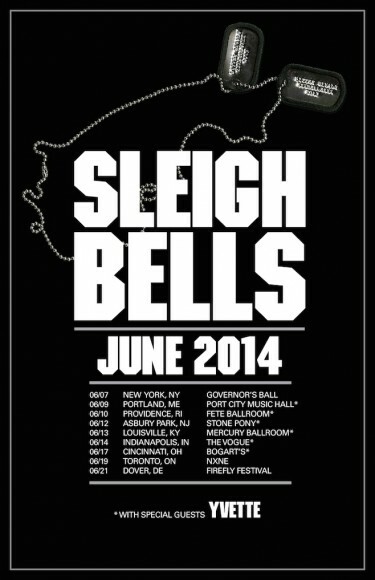 The June tour is in support of Sleigh Bells’ newest album, Bitter Rivals. To see the next time you can catch their live show, check out their June tour dates below.